Most of the games I ever play on mobile are either strategy or puzzle games in various forms. For the longest time, SpellTower was the only game on my phone, and I also liked Rymdkapsel. When I bought a new phone, it looked like I wasn’t installing a game on it anymore. But when I heard of Puzzle Forge 2 in a podcast, I had to try it out. From what I’ve seen, my time was certainly not wasted. Puzzle Forge 2 is a free-to-play tile-matching puzzle game that has you creating weapons, armor, and equipment from ore in a forge and selling them to customers. It’s basically match-three combined with Recettear: An Item Shop’s Tale in theme and execution while fitting it all in mobile format so you can play it on your phone or tablet. It does have the usual freemium trappings with microtransactions, but they’re kept discreetly beneath quality gameplay for the most part. If more mobile games are made like this and not designed from the start as cash cows that leech from “whales” and kids who stumble upon the flat plastic things with the numbers from their parents’ wallets, then mobile gaming would be in a much better place than where it is now. NOTE: I cropped out the advertisements on the bottom of the screenshots for mostly legal reasons. The graphics and color palette used for this game make for a clean look, and the performance is mostly smooth thanks to the Unity engine. There are details like season, day-night cycles, and the different customers that give it a sense of variety. For a little puzzle game, it does well by having its own world and lore of sorts, from the NPCs to the flavor text descriptions on all the items. It does look like the developers put care and attention to this free-to-play game, which isn’t that common for mobile titles. There are advertisements in the game, but they’re not too obnoxious and distracting. 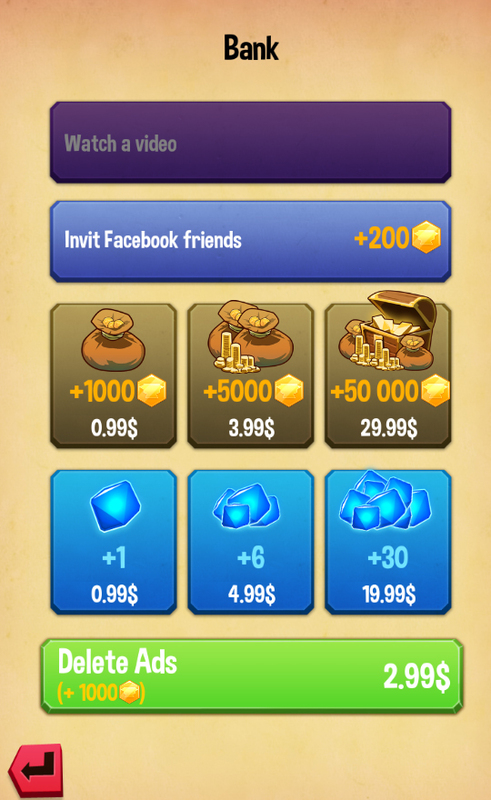 They’re mostly placed on the bottom of the screen, and the ads in between days are actually for other games. Mind you, there’s also the bank that contains the microtransactions. Puzzle Forge 2 doesn’t pester you with them, but they’re there in a corner just in case you have no patience at all and are trigger happy with your credit card. While discreet in its placement in the game, the shared presence of advertisements may rub some people the wrong way. There’s even a paid option for removing ads worth $2.99, which seems quite steep even if it includes 1000 coins. On the other hand, Tuesday Quest could have gone even more overboard with the microtransactions, but they don’t have to since they have ads to draw revenue from as well. The version of Puzzle Forge 2 that was played for this review did show some minor gaffes like typos, which make this game look like there was a bit of a rush to get it done. There’s nothing wrong with it and the quality of the gameplay more than covers for these signs. It’s a sequel, so it’s not like the developers were doubtful about their success. The whole blacksmith shop theme gives this match-three puzzle game a more objective-based gameplay that puts more pressure on the player. Customers come by to buy your creations; some of them would accept anything you come up with, while others may have more specific requests. There’s no time constraint, but there may be a limited number of turns for some pieces, and either the inability or refusal to deliver results in losing a life point. Naturally, you lose when you run out of life points, and you’ll have to start all over again. You can create weapons and armor in Puzzle Forge 2 from different types of ores — bronze, iron, silver, gold, and crystal. Three adjacent Bronze ores make an iron ore, three adjacent iron ores make a silver ore, and so on. Two of the same ore plus a mold on adjacent squares create a part, and three parts of a particular combination create the corresponding weapon or armor. Dubious metallurgical accuracy aside, bronze is the most basic as you have unlimited supply of it, while gold and crystal are very difficult since you have to go through every lower ore type to make them. Whenever you create a finished piece, the squares used glow red from the heat and rendered unusable for a certain number of turns, which is 60 by default. Each action you make, from putting down an ore on a square to forging a weapon is equal to one turn. You can forge equipment from parts made from different types of ore, but it’s still best to have them made from the same material to maximize the points earned in proportion to the amount of work you’ve put in each. Whenever you convert ore or forge something, the last square used is where that item will end up in, so you have to think ahead in order to actually create something, especially if it’s of higher quality. If you just put down ores on a whim, you may find yourself without available squares to use, which means you’ll be stuck and unable to create the requested item. Players would soon learn to not waste moves and think before putting an ore down a square. At the end of each completed day, points are totaled up depending on the satisfaction of each customer, which is measured by how you fulfilled their requests — whether you gave them the bare minimum or an item of superior quality. You then gain point bonuses, as well as gold to spend in the item shop. If you do get to master the art of making higher quality items, you may be able to churn out gold and even crystal pieces, which take a lot of thought and practice to achieve. If you do get stuck somehow, there’s a chest on the bottom right that leads you to the item shop, wherein you can purchase and use items that can help you out of a jam. This feature is handy most of the time, although it may seem a bit too convenient at times since a lot of the items are not that expensive at all and it’s easy enough to earn in-game currency if you keep selling at least all-silver equipment. There is also the academy, wherein you can acquire skills by using wisdom stones that you earn when you level up. For instance, when you’ve gained the jeweler and magician skills, you can add gems and magic to your pieces to make them more powerful. Gems are made just like any other part, while magic is gained by using the magic squares that tend to appear on your forge. Some customers may request equipment with gems and/or magic, and they won’t accept anything without them. You may also upgrade each of those skills to the third level for maximum effect. Seasons and the resulting weather conditions also affect the forge. Heat takes longer to dissipate during summer, while rain can instantly cool a red-hot square if it happens to fall on it. During winter, some squares can randomly become frozen, which prevents you from making use of it for the rest of that day. There are items that can help make those squares usable again, but you have to make sure that you really need that square in that moment before you use an item on it, like a Heat Stone to unfreeze it during a winter day. To mix things up in Puzzle Forge 2, there are some special events and exceptional customers who come by with unique requests. It could be a bunch of hungry kids who want to cook sausages on the hot spaces of your forge or a dragon warrior who needs a gold weapon. In the case of the exceptional customer, they’re the reason why you should keep your forge as clear as possible because that’s crucial for making gold or crystal products. There’s also the adventurer who asks for your help by having you construct something that has a high value of a specific stat, whether it’s attack, defense, or speed. That means the stats on the description are not just for show, and equipment with higher stats are worth more. Once you’ve given him your finished product, you can then follow his adventure to see if what you made would help him with his quest. Recettear had something similar with its own adventure segments, although the one in this game is more abbreviated. It's a game that most people can like, especially those who are in puzzle games. The mechanics takes a bit of time to figure out, but the basics are simple enough to understand. It's one of those games that mix different themes and genres to good effect, and most players can get the full experience without having to pay for anything. It's not super amazing, but still very likable. You may also look up my preferences in video games [here] for reference.